Read about people that we have helped over the years. We had seen our dream home and had started proceedings to purchase our new house. But we were in a chain and the people that had put an offer on our house had pulled out leaving us distressed, not to mention in dire need of a buyer for our house. We did not want to lose our dream home so we got into touch with 10 days. They made us an offer within 24 hours on our property and enabled us to proceed with the deal. They were very efficient and completed to our timescales. We are now in our dream home enjoying our new life. "In 2004 I was fortunate enough to land myself a fantastic IT job in central London. Within a year they had promoted me but I had to move offices to York. I was happy with the promotion, however the downfall was that I had to sell my current home quickly, as I was due to relocate within a month. A colleague recommended the 10 days property company, who came to see me at my house as requested within 24 hours. After surveying the property, they made an offer. The house was sold and the business completed to my timescale." Mrs Scott's mother passed away recently. In the will, the house was left to Mrs Scott. The property was in desperate need of repair and general modernisation. Mrs Scott didn't have the time, let alone the money to carry out the work. She needed a quick sale and contacted 10 days . "I am ever so grateful to 10 days at such an emotional time they were sensitive to my circumstances. They made an offer on the house which I was happy with and we exchanged contracts within a week. They kept me informed throughout the whole process and even paid for my solicitors costs." Mr Edwards from Leeds needed a quick sale of his property due to illness. He knew putting it on the open market with estate agents would take a while to attract a buyer so he contacted the 10 days property company and they took the whole process from there and made it easy for us. "...I am really pleased with 10 days property company, they knew what my requirements were and within days I had an offer on my house. The process was hassle free and allowed me to concentrate on getting better." Earlier this year Raymond lost his job which caused him a lot of stress and the financial strain of keeping up with the mortgage and loans that he had taken out. Unfortunately, like many of us Raymond didn't take out any insurance to cover himself. He was falling behind with the mortgage payments and started receiving eviction letters. Raymond was desperate to get his life back on track and resolve his financial situation. 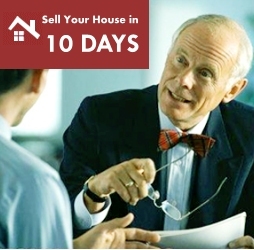 He contacted the 10 days property company, who assessed his requirements and showed him the options available. "I was desperate and didn't know what to do and which way to turn. Losing my job was a big blow and coming to terms with that was distressing enough. 10 days bought my property allowing me to release equity in my house to pay my debts off. They also offered me the option to buy back my house when I was in a better financial situation. I now have another job with prospects and am looking to buy my house back within the next 12 months.